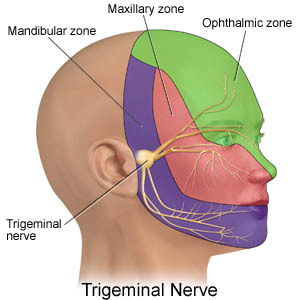 Trigeminal neuralgia (TN) is a condition that causes sudden and severe pain in parts of the face. TN is caused by a problem with the trigeminal nerve, which is a nerve that runs from the brain to the face. TN causes sharp and stabbing pain in the cheek, lower face, or around the eye. The pain lasts a few seconds to a few minutes, and usually happens on only 1 side of the face. TN can also cause muscle spasms in the face that happen at the same time as the pain. Most people with TN have repeated episodes of pain. Maybe. Your doctor or nurse should be able to tell if you have TN by learning about your symptoms and doing an exam. TN is usually treated with medicine. Doctors can use different types of medicines to treat TN. Most often doctors prescribe a type of medicine normally used to prevent seizures, called antiepileptics. These medicines quiet the nerve signals that cause pain in TN. For most people, the medicine helps reduce the number of TN attacks they have and makes their pain less severe. But if medicines don�t help enough or cause too many side effects, your doctor might talk with you about other treatment options. These include different types of procedures that quiet the nerve and make it less likely to fire. These minimally invasive treatments are very effective in reducing the intensity and the frequency of attacks. In many instances, they have even been shown to produce complete relief. If you are seeking treatment for trigeminal neuralgia in Singapore, our specialists at SPI are more than happy to assist you.